1,296 sq ft; lot: 10454 sq ft - MLS# 1631311 Courtesy of Shorewest Realtors, Inc. 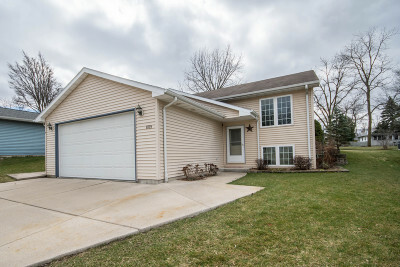 Nothing to do but unpack and enjoy in this well maintained 3 bedroom, 3 bathroom raised ranch on a quiet cul de sac. Updated kitchen has SS appliances and a generous peninsula island prep area with counter seating. Abundant cabinet space with both under and above cabinet lighting. All bedrooms are on the main level with a nice sized master suite with a walk in closet and attached full bath The open concept living area has vaulted ceilings and lots of natural light with brand new living room carpeting. Sliding glass doors lead to the spacious patio, deck and flat back yard for your outdoor entertaining needs or peaceful relaxation. LL has daylight windows and is framed just waiting for new owners to finish should they desire a 4th bedroom/office and rec room. Home Warranty Included!